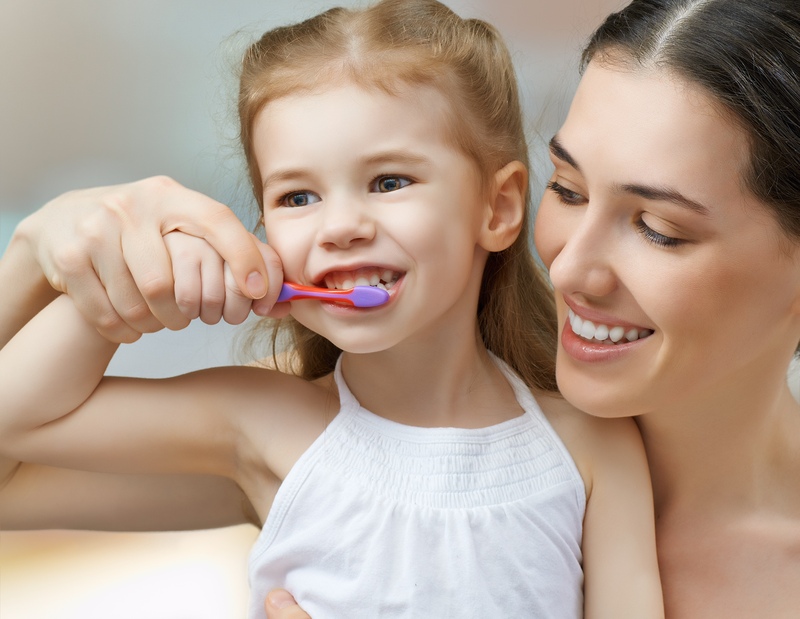 Oral health is an important part of children’s overall health. But because baby teeth fall out they often don’t get the attention they deserve. Baby teeth need to be babied. The germs that cause cavities in baby teeth can lead to cavities in permanent teeth, affecting your child’s smile and overall health for a lifetime. Baby teeth matter. They are important to a child who is just learning to eat and speak, and baby teeth help guide adult teeth into place. For children, the importance of a healthy, cavity-free mouth extends well in adulthood. Most people don’t know that cavities are caused by germs and these cavity-causing germs are infectious. The germs can actually be spread via saliva (typically from moms to babies) by sharing food, utensils, or even kisses. These germs can also lead to significant, ongoing oral health problems. If you’re pregnant visit the dentist and get any necessary treatment before your baby is born, and take care of your mouth afterwards. Here’s the good news. Kids don’t have to get cavities. Starting early, with good home care and regular checkups, will help to ensure that your child enjoys a lifetime of better oral health. Plus, it makes sense to prevent cavities, rather than paying to fix them. •	By age one take your child to a dentist or physician for an oral health checkup. •	If you put your baby to sleep with a bottle, use only water. •	Children need to brush their teeth twice a day for 2 minutes. Help your child brush their teeth until they can tie their own shoes. •	Use a small toothbrush and fluoride toothpaste. Fluoride strengthens teeth enamel helping to prevent decay. Use a rice-sized amount of toothpaste until your child is 3 and then a pea-sized amount. •	Start flossing as soon as teeth touch. Flossing reaches 40% of teeth surfaces that a toothbrush can’t reach. •	Ask your child’s dentist or physician about fluoride varnish, which is painted on the teeth to prevent or heal early decay. •	Set an example and take care of your own mouth. Brush and floss with your child and make it fun. •	Choose healthy snacks such as nuts, cheese, fruits and vegetables. •	Sweet liquids including juice, sport drinks and soda (even diet) cause cavities. •	Avoid “grazing” snacking and drinking sweet liquids frequently throughout the day. Teeth need time to rest in between eating and drinking. •	After eating, the germs in your mouth make acid that attack teeth for 20 minutes. Rinse with water if you can’t brush. Visit TheMightyMouth.org for more information on protecting your child’s oral and overall health and for tips on smart snacking. Published: Nov. 4, 2015, 12:36 a.m. Updated: Nov. 18, 2015, 12:36 a.m.